Exhibition Opening – 10 girls. 10 colours. Thank you to all who attended and supported the opening of “10 girls. 10 colours” last night. We had an amazing turnout and were glad so many people could see the terrific work produced by the tenmoregirls collective. For those of you who missed the opening, the exhibition continues until the 6th of November. The girls will be running free kids workshops and artist talks on Saturdays, so be sure to come by. classes and talks on the Amazing opening last night! Congratulations to all the artists, and thank you to everyone who attended and supported “10 girls. 10 colours”. This exhibition runs until the 6th of November, so be sure to check it out you missed the opening. View more information and images by clicking here. Salerno Gallery is currently accepting exhibition proposals from artists and curators for our 2012 program. We are encouraging exhibitions across all contemporary visual practices, particularly where the artist responds to a figurative element through their own unique and creative medium. Our ground floor exhibition space is light and airy with three large windows facing the always vibrant and active Glebe Point Road. It features over 65m2 of floor space, versatile hanging/display options, track lighting and 24 hour street exposure. Walls are white painted concrete and the floor has a neutral concrete surface. A selection of plinths are available upon request. If you’d like more information or want to request an application form, please visit our Hire Space information page. As always, feel free to join our mailing list or like our facebook page and be kept up to date with future news and events. Thank you to all who attended the exhibition opening of NOICON last night. It was a terrific turnout and we were glad so many could come and see Simon’s new work. We will be uploading some photos of the night soon. To all of those who couldn’t attend the opening, the exhibition runs until the 27th of August, so be sure to come by. NOICON is a new multi discipline exhibition by Sydney based artist Simon Lovelace which includes sculpture, installation, screen printing and painting. View more information and images by clicking here. To all those twitterers out there, Salerno Gallery has now also entered the twitterverse. Our address is http://twitter.com/SalernoGallery if you want to join us. We will be posting updates and news relating to the gallery, artists, and art scene in general. Feel free to interact and notify us things you also find interesting. Join us for Show of Care, and upcoming exhibition of ceramic works by Jan Howlin. These aren’t your conventional ceramic bowl or vase objects on display, but an exploration into the maintenance of every day life, through rituals and objects often taken for granted. Show of Care is concerned with the way everyday life is maintained within the home. It has been made in homage to my mother, whose care for me and my family, usually taken for granted, sustained and enriched our lives. In exploring a number of the domestic activities, tasks and rituals fundamental to the experience of home she created for us, I hope to highlight the profound value of care, loving and giving in everyday life. The exhibition runs from the 23rd May – 11th June, 2011, so be sure to come by and view Jan’s terrific work. You will undoubtedly already know of Anton’s extremely successful exhibition entitled Lagomorpha held at Salerno Gallery last month. But check out what else he’s been up to. Anton recently completed a commission work for the Yahoo!7 ad:tech trade show at the Sydney Convention Centre, Darling Harbour. For the trade show he drew a three metre square chalk mural on the ground with a three dimensional perspective. 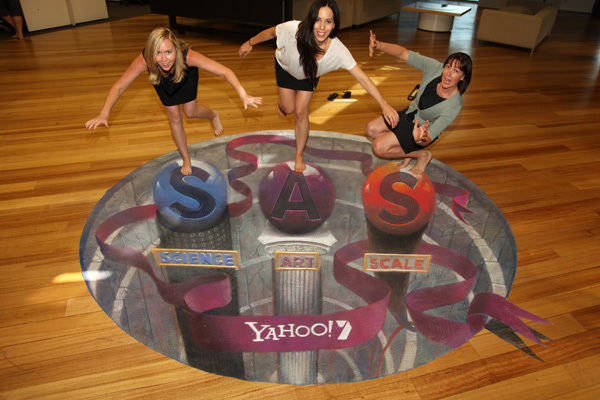 It was all about representing Yahoo!7’s proposition of Science, Art and Scale and seemed to really engage people who had a lot of fun posing and interacting with the mural. 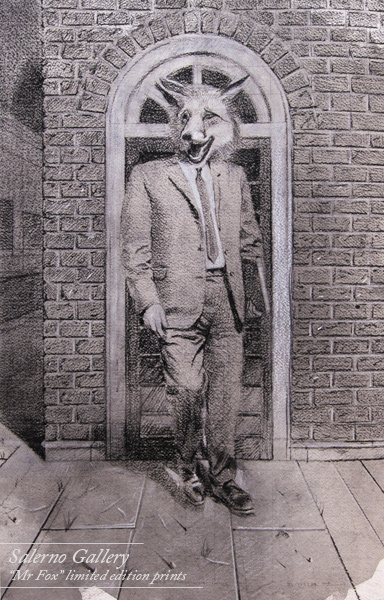 Following the staggering success of Anton Pulvirentis’s show Lagomorph“, Salerno Gallery is pleased to announce the limited edition art print release of “Mr Fox”. Lagomorpha explored the experience of Italian-Australians interned throughout Australia during World War Two and its inter-generational transmission to the present day. Melding human and animal forms in the landscape, Anton gives us a unique insight into the psychological undercurrents of the internee experience. Each limited edition measures approximately 13×20 inches and is printed on acid free premium-grade fine art rag media using the finest archival pigment ink. All editions are hand signed and numbered by the artist. Framed and un-framed options are available. Numbers are limited so please contact Salerno Gallery to register your interest. We have an amazing new exhibition opening on the 22nd of February. Salerno Gallery is proud to present “Lagomorpha”, a solo exhibition of illustrated works by Australian artist Anton Pulvirenti. Each image is a narrative telling part of a story from Anton’s emotionally charged perspective. Anton’s familial view of the Italian Australian internments of World War Two calls upon the viewer to compare the Italian experience of the war to that of introduced pests such as the fox and the rabbit. Be sure to join us at the opening night on Thursday the 24th of February 6-8pm. The show is running for a month so you have plenty of time to view Anton’s amazing work. To coincide with the 15th biennial Ausglass conference in Sydney, Salerno Gallery is proud to bring you OBJECTIFY / OBJECTDENY along side Glass Artist Gallery’s From Within exhibition. The exhibited works seek to re-define the “object”, drawing from artists working in glass whose work gives broad and diverse interpretations of traditional object themes. Tevita Havea, Sue Hawker, Zoe Johnson, Denise Pepper, Lorry Wedding-Marchioro, Rob Stewart, Kirra Kehlet, Mark Eliott, Spike Deane, Marina Hyasat, Nudibranch, Rebecca Coote, Chieko Tagami, Marcus Dillon. Salerno Gallery has just reopened after an extensive refurbishment. We’re pleased to be back open to the public and showcasing some terrific art again. There are a number of exhibitions planned for the rest of the year that should appeal to a variety of art lovers. Keep an eye on our “Exhibitions” page for more information. Speaking of current exhibitions, be sure not to miss “Scrabble Cheats & Other Misdemeanours”, a collection of work by quintessential Australian artist Eris Flemming showing from the 14th – 19th September 2010. As always, feel free to sign up to our newsletter (bottom of this page) to be kept up to date with future exhibitions and other news. We’re currently open to exhibition proposals so don’t be shy! Visit this page for more details. Hope everyone is enjoying the warmer weather.